Jimmy Capps has played and recorded with so many great artists that trying to list them all might easily fill this magazine from the cover to the back page. 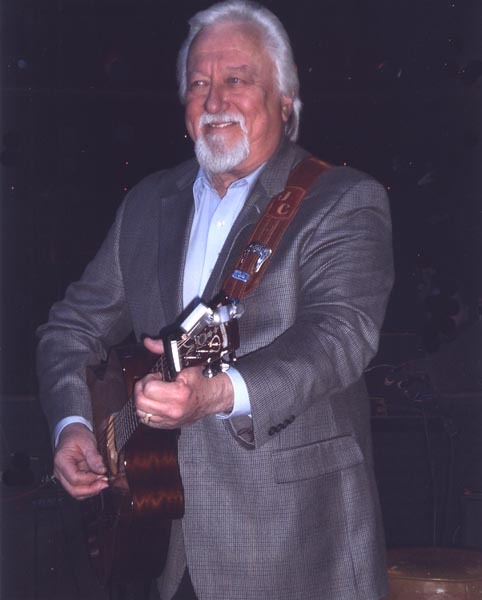 For the last 51 years the sound of his guitar playing has graced the stage of the Grand Ole Opry and been enjoyed by countless thousands of country music fans from all over the world. Since 1959 his playing can be heard on scores of hit country records from the classic George Jones song, "He Stopped Loving Her Today", to Alan Jacksons', "Here In The Real World" and "Wanted", Kenny Rogers', "The Gambler" & "Coward Of The County", John Denvers' "Some Days Are Diamonds", George Straits', "Amarillo By Morning", The Oak Ridge Boys', "Elvira", and John Conlees', "Busted". to name a few. He's also played guitar with Ray Charles, Dean Martin, JJ Cale, Julie Andrews and Andy Williams, so make no mistake about it, Jimmys' guitar playing crosses many musical boundaries. In 2001 he was voted by his peers to be awarded R.O.P.E. 's prestigious Musician Of The Year Award. Most recently his hometown of Benson, NC, honored him by declaring an offical Jimmy Capps Day. Meet Jimmy Capps. Bronson: How old were you when you moved to Nashville? Jimmy Capps: I was 19 years old. I came here to work with the Louvin Brothers, Charlie and Ira Louvin. When I was first learning guitar and listening to the radio back in the mid fifties, they were my favorite duet. I never dreamed I'd be able to work with them but I got a call from Charlie and I met them in Burlington, NC, auditioned, got the job, and I came to work in Novermber of 1958. Bronson: Do you remember your first master recording session? Jimmy Capps: The first session I did was in 1959 when the Louvins' were trying to lean a little bit towards a little rockabilly thing and they cut a song called "The Stagger" and on the back side of it was "Nelly Moves To Town", which was a typical Louvin Brothers' song but "The Stagger" was kind of a little rockabilly thing and Hank Garland, well known guitarist who got hurt in the '60's in a car wreck and never did return to the recording scene again, he and I both were on it and he treated me like I was a king and I shouldn't have even been there (laughing}, He was the one that was the pro and I was kind of the amatuer at it but thank goodness they let me record all their stuff. I recorded with them the whole time I was working with them. Bronson: Do you have a preference for playing live or in the studio? Jimmy Capps: I like both because I just think it gives you two totally different feels of music. As you know in the studio you gotta be precise, perfect, as perfect as you can be, and live music if there's a little error here or there everybody just kinda says that's the human element in it you know and they accept it. I think most of the public almost enjoys seeing a little mistake every once in a while if it happens accidentally you know, so I like both sides of the coin. Bronson: When you go to a session, what guitars do you take? Jimmy Capps: Well I've got a 1961 Martin guitar that I bought from Harold Bradley, a well known guitar player of the A Team. I also have a Taylor guitar and it's a dreadnought that's similiar to a D28 and I love that guitar. I've been playing Blueridge guitars as of late. They're really great guitars and I use one of them in particular on the Opry because they take the sound off the pickup and it's got a great pickup system in it and the intonation on it is so true. No matter where you put your capo it's still in tune so I've been using Blueridge guitars for the last five or six years. I've got a hybrid 1957 Fender Stratocaster. The body and the pickups, the volume and the tone pots are Peavey guitar products and the neck is an Eric Clapton Fender neck, and that's my favorite electric guitar. If somebody wants a big bodied sound I'll take a F hole, I've got a copy of a D'Angelico that I really like and I'll take that. I also take a dobro, a 6 string tic tac, I've got a baritone Danelectro I take that's tuned to A, and I'll take a gut string. Sometimes I'll take a high string where all six strings are tuned up an octave. That's a Ray Edington invention right there, between him and Hank Garland and Grady Martin. Bronson: What kind of strings do you prefer using? Jimmy Capps: I use GHS, we actually endorse GHS but I don't just use them for that reason, they're just really great strings. I use a light gauge for my acoustic guitars starting with a 12 and for my electric guitars I use a 10 gauge and they're GHS also. Bronson: Is there anything you have coming up that you'd like folks to know about? Jimmy Capps: Yes, I'm part of a brand new TV show for RFD-TV that I'm really excited about. It's called, "Larry's Country Diner" and it's hosted by Larry Black. �We just recently finished taping 13 episodes and in it I play the part of the town Sheriff (laughing) who just happens to play the guitar. Every episode features a guest appearance by a different great artist and we had so much fun taping the show. I think it will start airing in October and that the audience will really enjoy it. I�m also going to have a web site that's being put together now and should be up before too long and jimmycapps.com will be the address. Note: Jimmy has such a huge career and he definetly needs to be recognized for his incredible accomplishments so I'm going to be sitting with Jimmy again for a more extensive interview soon. I'll let you know when I do because he is one of a kind and such a great player in addition to being a real gentleman. It was quite an honor to interview him.